The only serious European mining sources for porphyry in the late 18th and early 19th Centuries appear to have been the valley of Älvaden (Elfdal) and its bordering parishes. Mining began in the 1780's and the works were acquired by Charles XIV, the first of the Bernadotte kings of Sweden, with the intention fo introducing the splendor of the French Empire style to Sweden. 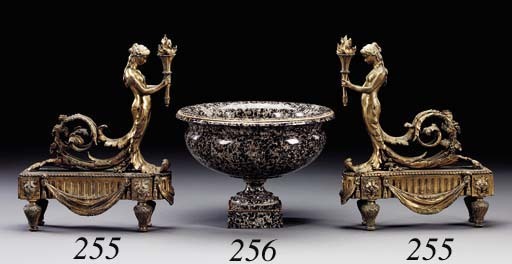 At this time objects in a variety of types of porphyry were distributed throughout Europe as diplomatic presents. An inventory prepared for the Mining Intendance at Stockholm at the beginning of the 19th Century lists at least twenty-two types. Two kinds are properly categorized as granitelle, and the remaining twenty are named after the parishes of Älvaden from where they were quarried; Blyberg, Dysberg, Bredvad, Orrlok, Klitt, etc., and in the case of the offered lot, Äsby. (see H. Sundblom and I. Turnader, Porphyre-La Pierre Royale, 1990, p. 2). Porphyry was quarried out of rock as well as extracted out of stone in riverbeds. The Älvaden works were sold by the Royal Family in 1856 and were destroyed by fire ten years later. Subsequent production was sporadic and limited.